The real-time strategy video game Supreme Commander 2 was released by Square Enix in 2010. 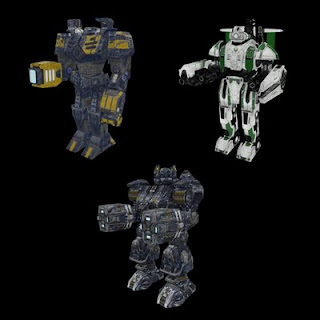 Part of the marketing for the game was the release of paper models of several of the armored command unit robots seen in the game. In addition to the three robots shown above, there is also a less 3D paper model of a "cybranosaurus" for papercraft beginners. The templates for all four models may be downloaded here. 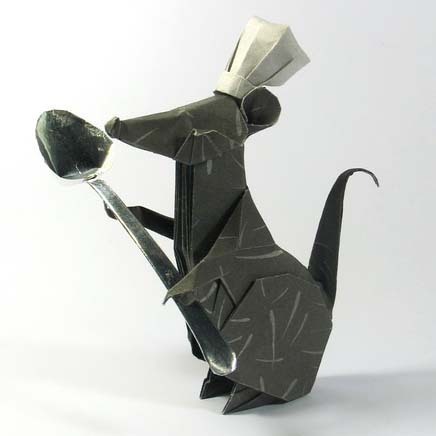 Here is a delightful origami piece by Nguyen Hung Cuong which he calls "Rat Chef" (an homage to Disney Pixar's Ratatouille perhaps? ^^). The rat, the chef hat and the spoon were each folded from separate piece of paper. 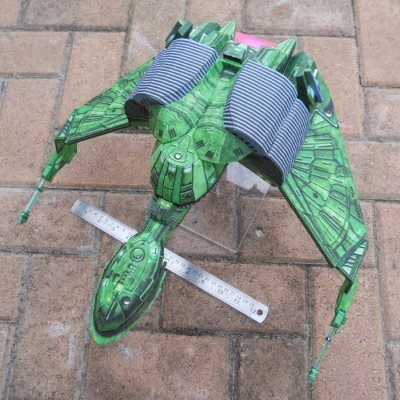 The folding pattern for the rat (spoon and hat not included) may be downloaded from Cuong's page here. At the University of Kansas (my alma mater! ), the School of Engineering has an ongoing design project to create sustainable approaches to automobiles. One of the first successes of the project involved converting a 1974 Volkswagen Super Beetle into a plug-in series hybrid that can be recharged using either a generator running on used cooking oil biodiesel or a solar energy filling station. 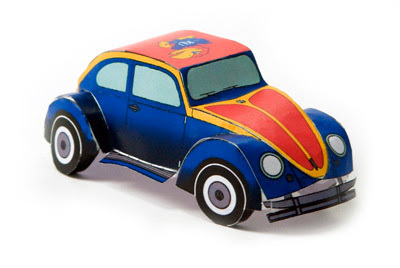 A paper model template of the VW (dubbed the "EcoHawk I") may be downloaded at the KU website. I don't have much information on this papercraft of the character Pit from Nintendo's Kid Icarus series of video games. 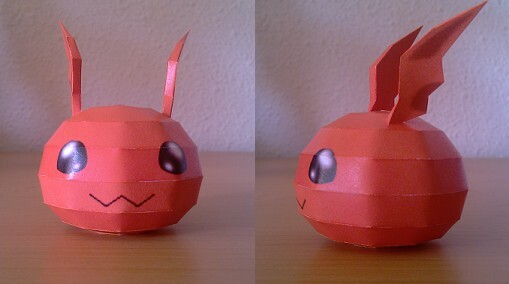 What I do know is that the template for the paper model was created by former DeviantART member Sora243 in 2008. The model may have been based on a 3D model from the Super Smash Bros. Brawl video game, although I can't say for sure. 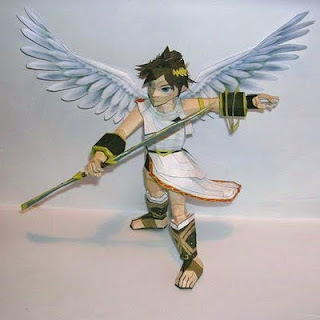 Pit is an angel from the mythical world of "Angel Land". 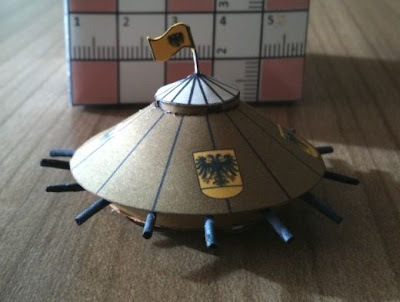 Papercraft templates in PDF and PDO format may be downloaded here. This month's offering in my ongoing Kingdom Hearts 2 treasure chest series is from the Land of Dragons area of the video game. Land of Dragons is based on the 1998 Disney movie, Mulan which tells the tale of a girl in ancient China who disguises herself as a boy in order to join the military. 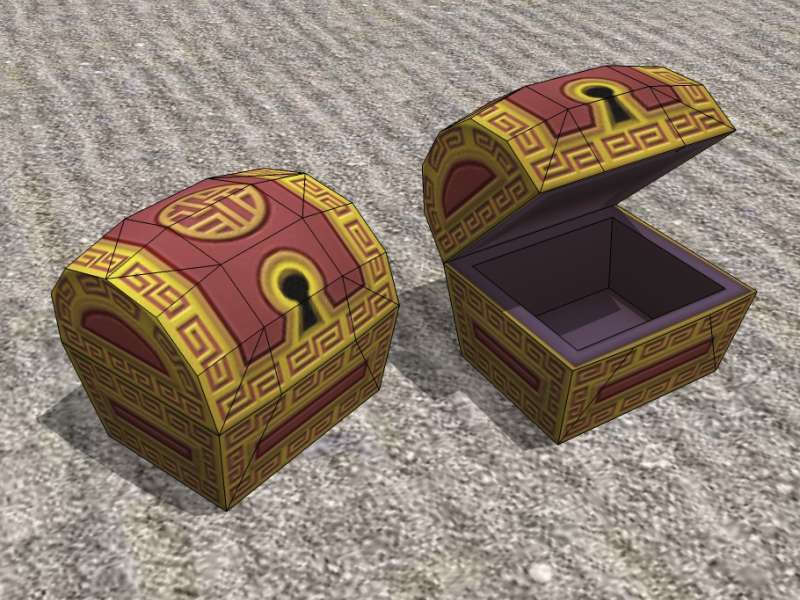 The template for this treasure chest paper model is available here. POdragon (aka Jyxxie) has a new Digimon papercraft site up and running! The first release for the "Papermon" website is a Jyarimon paper model. Jyarimon is a newly hatched digimon who eventually evolves in to Guilmon. The template for this papercraft may be downloaded here. Here is another Star Wars papercraft from Goozi. 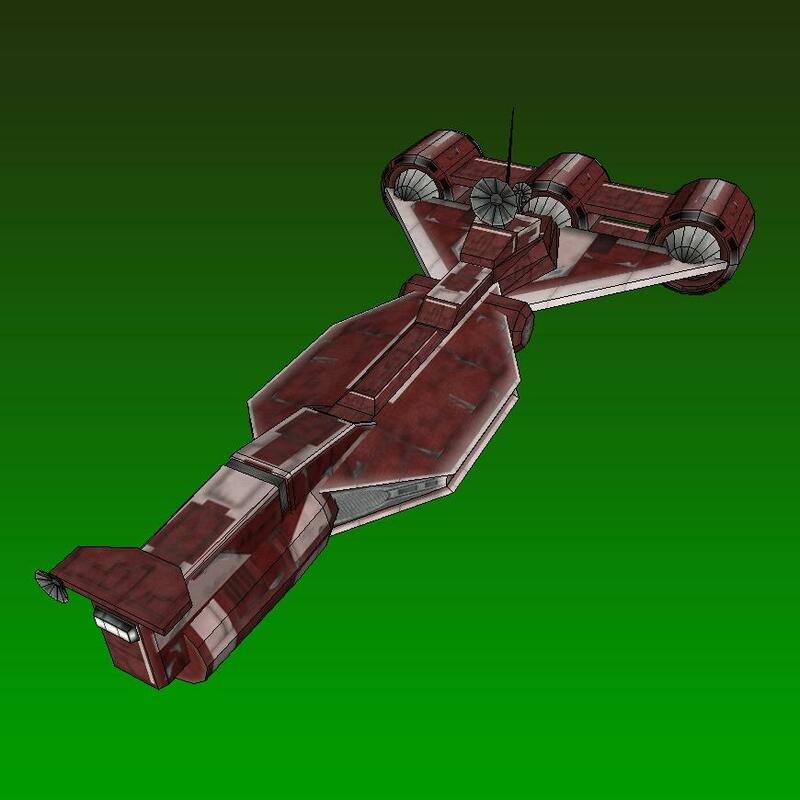 This paper model is the Radiant VII, a Consular-class cruiser that appears at the beginning of Star Wars Episode I. According to the Star Wars wiki, Consulars in diplomatic service are painted red to declare their diplomatic immunity. Shortly into Episode I, the Radiant VII is destroyed while it is docked inside a Trade Federation ship. The PDO format template for the ship may be downloaded here. Even though the comic strip ended in 1995, Calvin and Hobbes still holds a fond place in the hearts of many (including myself ^^). 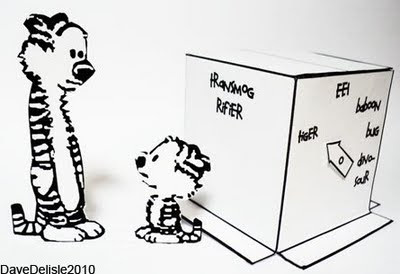 This simple papercraft diorama by Dave Delisle depicts the boy Calvin (right) encountering his tiger friend Hobbes (left) after Calvin has been transformed into a tiger by the cardboard box "transmogrifier" in the background. The template for the diorama is available as a .PNG image file and may be downloaded here. I have been receiving some great build photos lately! 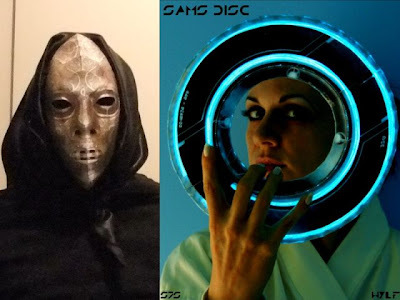 On the left is a photo of John George who built my Death Eater Mask #3 to wear to the opening of the final Harry Potter movie (kinda reminds me of Doctor Doom ^^). 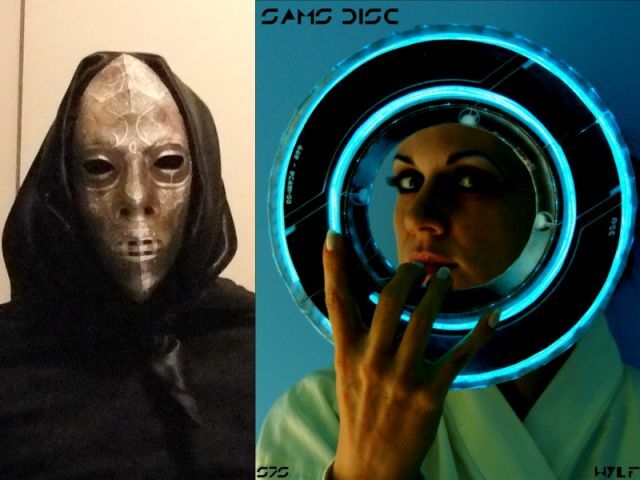 On the right is a build of my Sam's Identity Disc (Tron: Legacy) by my DA friend Wylf who enhanced the papercraft with some clear plastic and el-wire. Keep up the good work guys! 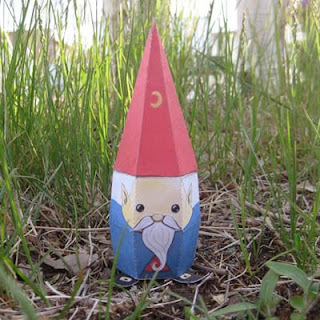 This cute gnome papercraft was created by two young brothers, Kai and Dakota, who are only 11 and 12 years old! The word "gnome" is thought to be derived from the Greek word for "earth dweller" and the term first appeared in the writings of the Renaissance alchemist Paracelsus. Kai and Dakota's six piece template for the gnome may be downloaded here. "...da Vinci was a great inventor, drawing up plans for contraptions hundreds of years ahead of his time. One of these inventions was his moving gun platform (affectionately called the Turtle). This was the closest to a modern day tank that humans would contrive of for four hundred years." A download of the template for the tank is available here. When I first started working on this papercraft of Pooh Bear's hunny pot, I had no idea that a new Winnie the Pooh movie was being released by Disney, but I am happy to be able to offer this model the same week as the opening of the movie in the US. This paper model is based on a 3D model from the Kingdom Hearts: Birth by Sleep game for the PSP video game system. The finished piece stands about 5" (12.7 cm) tall. 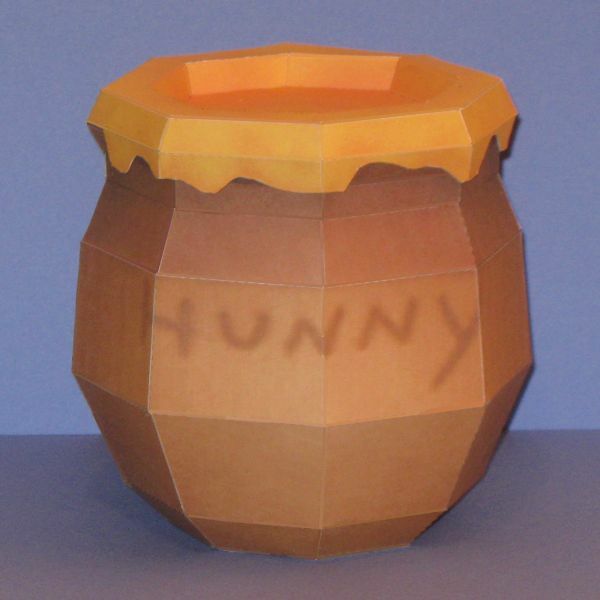 A download of the PDF template for the hunny pot is available here. 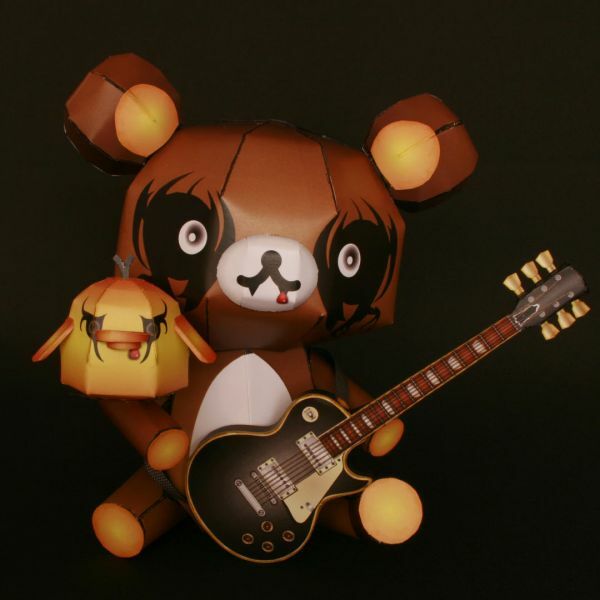 Popular Japanese characters Relakkuma (Relax Bear) and Kiiroitori are given a Heavy Metal music makeover by Ikarusmedia. The papercraft template even includes a Les Paul guitar! Look for the download link for the PDF file in the upper right corner of the page here. 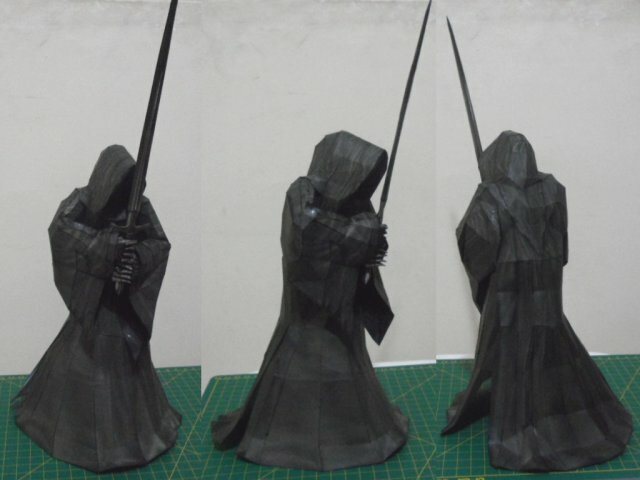 Not finding enough Lord of the Rings papercraft on the Internet to suit him, Andre Correa decided to create some of his own. The result was this Ringwraith papercraft. In the LOTR trilogy, the Ringwraiths (or Nazgul) are powerful servants of the evil ruler Sauron. This paper model is based on a 3D model from the Return of the King video game and may be downloaded here. One of the foremost adversaries in the Yu-Gi-Oh! anime series, Marik Ishtar is the possessor of the Millennium Rod. According to the Yu-Gi-Oh! Wiki, the Millennium Rod "grants the holder the power of bending wills of others through mind control and also lets its user telepathically communicate with their servants." 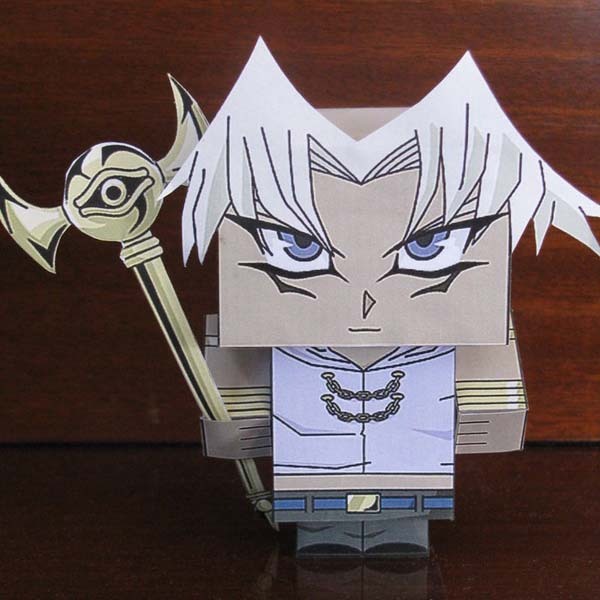 This Marik cubee was designed by the Animepapertoys blog and may be downloaded here. The build photo is by xOxChelseaxOx at DeviantART. The Teenage Mutant Ninja Turtles began as a black and white comic book in 1984 and the rest, as they say, is history. Graphic designer Armadilloboy has created a set of lovable TMNT paper toys. 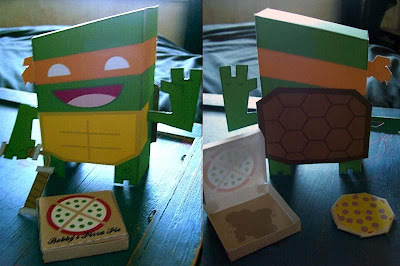 Each of the four toys comes with it's own pizza (which just may inspire me to add another pizza to my own pizza paper toy series! ^^) Pictured above is Ninja Turtle Michelangelo. Templates for Mikey and his three pals may be downloaded here. In the DC Comics universe, the members of the Green Lantern Corp each wear a green power ring. Including the Green Lantern Corp, there are a total of nine different Lantern Corps. Each corp is represented by a different color. The colors of the corps cover the seven colors of the rainbow, plus black and white. 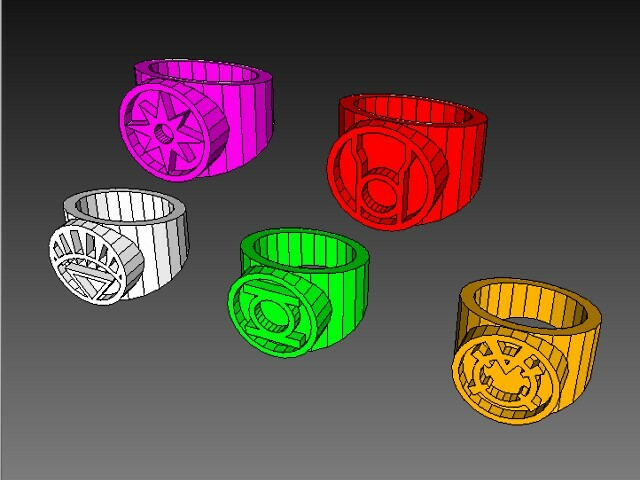 Designer "Tkamen" has created papercraft templates for the rings of power for each of the lantern corps, five of which are shown above. The PDO format templates may be downloaded here. The finished rings are rather large with a 1 1/2" (3.8 cm) diameter. I wanted a smaller scale Green Lantern ring, so I took the liberty of creating a scaled down version of the template in PDF format which is available here. Unfortunately, there are no instructions available for building the rings other than the PDO. UPDATE 10/6/2012: The download above for scaled down green ring template now includes scaled down templates for the red and blue rings as well!